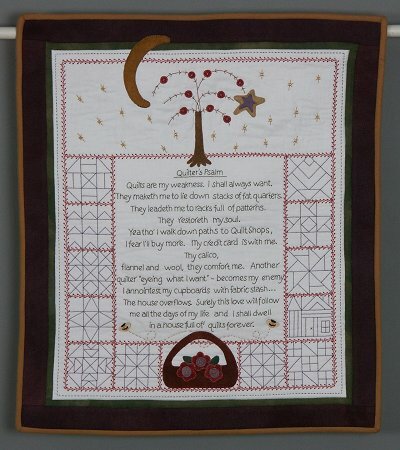 I ran across this picture of this little quilt while searing the internet for something else. I thought it hit too close to home so had to share it. Quilts are my weakness, I shall always want. They maketh me to lie down stacks of fat quarters. They leadeth me to racks full of patterns. quilter "eyeing what I want" - becomes my enemy. in the house full of quilts forever.